Interview with Mr. Anil Aggarwala Hindu Vedic Astrologer, Awarded with SAROJ MEMORIAL AWARD for Best Research in Astrology in the year 2011-2012. 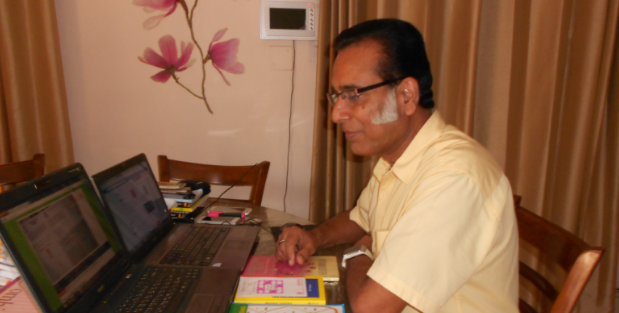 His Articles are Published in all the Leading Astrological Magzines of India along with the Astrological Magzines in the US. I am personally following the mundane predictions of Mr. Anil and they are very accurate. Mr. Anil, we are honored to have this chance to interview you for our students and visitors. Tell us about your choice of the hindu astrology. How come you chose it over the modern one and why you think it is working better than the contemporary? What makes the vedic astrology so unique? My Father use to consult an Vedic Astrologer who happen to be the leading Astrologer in the Country. At the time of 1947 Mr. Hardeo Sharma Shastri Trivedi , gave the Time of the best Muhurat for the India Independence . He was also the Astrologer for the President of the Country then . In the Year 1966 My Father was Posted in a State and City where this Astrologer resided in Solan District (H.P) India and gave amazing Predictions to my Father . In the Year 1986 One of the Astrologer Predicted that I would Visit 5 Countries and I challenged him with his Predictions and told him I would not get my Passport made , latter all was done with in 3-4 days by a Person whom I had helped in getting a job for his Son as return since he helped me in a Car challan of My Brother in Law. I could not imagine he was also the Passport officer of the City and got my Passport made , when I had told him that I was not interested and had challenged an Astrologer . The Predictions of the Vedic Astrologer were on dot and I visited the Countries mentioned by him . Since then I use to wonder if I could learn this science and use to spend time with him on holidays and developed deep interest , but since occupied with my Profession I could not pursue it then . I find your analyses of the financial markets and your predictions in the mundane astrology amazing. Tell us more about this. First, what makes you so much attracted to this so difficult sector of astrology, I would say, the most difficult one? How good is the vedic astrology in predicting mundane events and how exact it can be when predicting market changes? Please give us an example. It has been observed that when the Major Planets which are slow moving go in retrogression they behave erratically and bring about bullish trend in the Financial Market. The Cycles of such Planets are most important and the Prime Importance is on the Planet Saturn the 10th and the 11th Lord of the Natural Zodiac, Jupiter the 9th and the 12th Lord of the Natural Zodiac , Rahu the North Node and the Significator Mercury. 59 years back Roman God Saturn was fallen in Scorpio on the 2nd June 1958, and what ever Results were given these 3-4 Planets were bound to repeat since the lowest common fact among the slow moving is 30 years and Saturn would come back to the same position as in 1958 as a Fallen Planet in June 2017 onwards and repeat the results. Saturn attained the status of a Fallen Planet after 21st June 2017 and repeated the results we all know . Read My Article in this Regard https://www.astrodocanil.com/2017/06/59-years-back-roman-god-saturn-was-fallen-in-scorpio-on-the-2nd-june-1958-unfolded/ written much in advance of the actual haenings. My Predictions asper this Principle proved on dot. Which are the predictive technics that you use? I Use Tamil Texts of the Hindu Vedic Astrology . 1.Prashna Jyotish By Tamil Texts. 3.Mundane Astrology Require 39 charts. 24 Lunation charts , 12 Solar Ingress charts, Foundation chart of the Country, New Moon Pieces Chart, Republic Chart, My Research Vedic Progression chart By Tamil Texts. 6.By the first Letter of the Word Uttered. 7.By the Direction Faced by the Querist . 8.By the Body Parts Touched By the Querist. 9.By an Ashtmangla Number Between 100-999. 10.By Omens and Actions of the Querist. 11.By the time of the Query only (Prashna Triangle) My Research On Spot Predictions with this. 12.By the Breath of the Astrologer from Left or Right Nostril at the time of Query. 13.By Cycle of Planets in Transit. Would you share an exceptional predictive method that exists only in the vedic astrology and that works without mistake? Give us an example from the reality please; you predicted the result from the elections in 2016 saying correctly that Trump will win. You also wrote on your website https://www.astrodocanil.com/ about North Korea and USA. Would you share with us this particular prediction and how you see this mundane problem developing? You are mentioning the omens, perhaps ancient vedic indian ominous phenomena. This is fascinating. In our School of Ancient Astrology we do have knowledge of the ancient Babylonian omens, but we know nothing about the vedic omens. Please share some knowledge with our students. Could you give us an example of the indian astrological omens, and could you be so kind to recommend literature? What about the importance of the eclipses? How important are they in your predictions, and do you analyze them as well? I would like to ask you about the astrological magic in the vedic astrology? Do you use it yourself and is there any recommendation of astrological magical ritual that is so impressive and you want to share with us? Would you give us an example of astrological magic? The Magic of Astrology is Communication with Mother nature and I have found that Nature always guides us , it is we who ignore it and if we follow the same we could handle the situations in a better form in all situations . Please advise our students what are the qualities of the vedic astrologer of antiquity that they need to have in order to become good astrologers. Do you find that they need to be esoteric and spiritual as well? ← Roman God Saturn, Red Planet Mars, South Node Ketu In 2018-2019: What They Have Up Their Sleeves ?